Large summits are nothing new. The 36th G8 summit will set up shop in Huntsville June 25-26. Toronto, a past host, will this time welcome the 4th G20 summit June 26-27. The following is the fifth in a six-part series of briefs looking back on past G7/G8 summits and protest. Check back each Sunday for a blast from the past when we recap a different summit's official agenda and civilian and activist responses. In the words of Waldo Bello, Senior Analyst with Focus on the Global South, the Gleneagles summit was British Prime Minister Tony Blair's attempt to give the G8 a “facelift” in a battle for the “souls of global society.” Dubbed the "Year for Africa,” the 2005 Summit's focus was aid for Africa and achieving the Millenium Development Goals. Some progress was made: G8 leaders established the “Commission for Africa” and addressed issues of corruption, HIV/AIDS, improved aid provision, education, trade justice, debt cancellation and security. “Though the G8 has made substantial progress in debt cancellation," wrote Saran Yun of the G8 Research Group at the University of Toronto, "its contributions to effective aid, education, anti-corruption measures, and the fight against infectious diseases have been minimal. In terms of trade reform, the G8’s performance has been dismal at best.” Despite the emphasis on developing countries at Gleneagles, at the following G8 meeting in St. Petersburg, Russia, African development had all but disappeared from the G8 agenda. A report by watchdog NGO CorpWatch highlights the strong presence of corporations at the Glengeagles summit. “Blair, [Gordon] Brown and Bono say they want to use the Gleneagles summit to tackle the issues of climate change and poverty in Africa. We argue in this report that the corporate agenda advanced by the G8 ultimately contradicts the achievement of any genuine and lasting ecological and social justice. Precisely because of the corporate agenda, any pronouncements from the G8 are likely to be nothing but ‘greenwash,’” states the report. The "7/7" London bombings occurred during this summit, not believed to be a coincidence. Thousands converged on Gleneagles to protest the summit. Security forces attempted to create a “sterile zone” free of protests: high metal fencing and concrete blast barriers were erected around the town and an “air exclusion zone” was imposed. ID “access passes” were distributed to residents to easily identify outside protesters at roadblocks and checkpoints. 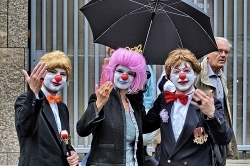 The Clandestine Insurgent Rebel Clown Army (CIRCA), a network of clown affinity groups, attended the Gleneagles protests. According to CIRCA member General Unrest, CIRCA uses a combination of street theatre and play-tactics to “undermine and ridicule the intimidation and provocation of security forces at demonstrations.” By blowing kisses at police officers, or encircling a group of police who had cornered Black Bloc protesters, CIRCA helped diffuse tense situations and expose the ridiculous security measures at the summit.